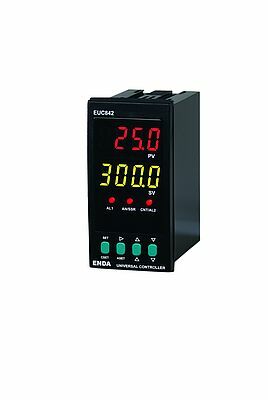 ENDA EUC 842 from Sisel is a programmable universal digital controller with a selectable relay, SSR, 0-20mA or 4-20mA control output for On/Off, P, PI, PD, PID, action, and soft start or self-tuning function. For the alarm output, selectable NO or NC relay offers 4 different output types. The unit is provided with input for Pt100, thermocouples (J, K, T, S, R), 0-20mA and 4-20mA. Optional RS 485 module is available for communication via Modbus RTU protocol. Both the set and process values are viewed on a 2x4 digit display. The product allows 3 levels parameter protection to prevent unauthorized access to setting. To provide environmentally safe products to the world, the company applied RoHs standards and currently all ENDA brand products carry RoHs mark on the label of products. ICPDAS is manufacturer of industrial measurement and automation technology, operating successfully in the market since 1993. User friendly: Pre-installed software. Portable device with multiple connection methods. Ready to use immediately. Can be connected remotely. Mobile multi-protocoll diagnostics for all Industrial Ethernet and PROFIBUS networks in your facility. LAPP is a leading systems provider that develops, manufactures and delivers connection solutions for the world of cable technology. Whether for Industry 4.0 applications, automation, mechanical and plant engineering, power supplies, mobility, or the food and beverages industry – with its 17 manufacturing locations on four continents and sales representatives in some 140 countries, LAPP is right there on the spot to provide you with its expert advice and tailor-made products. Linear Conveyor Module LCM 100: from "Flow" to "Move"